Returning to "work" after a quiet few weeks here at www.clothingtallmen.com, I found some interesting items in my post-bag : two clothing firms newly set up to cater to tall men. Every tall man knows the frustration of struggling to find quality clothes that fit, but few of us would be dedicated enough to create a company to meet that need. Today I am delighted to be able to share information on Longshot Apparel and M Jeans. UPDATE IN MAY 2016: Coming back to this blog after a quiet year or two, I have been checking through old articles to ensure that everything is still up to date. Sad to say, both Longshot Apparel and M jeans have gone out of business but I have left the details below as a tribute to firms that fought valiantly to increase clothing choice for tall men! This is a shame since these are exactly the kind of business that are committed to providing the sizes that bigger companies may not. However, for anyone else thinking of starting a tall business I would urge caution. Mass customization is making it easier to order shirts and chinos to your exact measurements from companies that have benefits of scale (not only tall people order custom clothes). 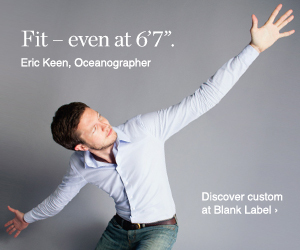 I have recently profiled Tailor Store for shirts and chinos and I have also been happy with shirts I have received from Blank Label. Jeans are also something where logos, brands and choice of shades and washes make it difficult for a tall company to compete with a retailer like Buckle that offer some long inseams as part of a much bigger range. But I will continue to profile tall clothing businesses as I hear about them and I would be happy to hear success stories, even if they prove me wrong!! The first firm is Longshot Apparel, which was started in 2009 by Mark Tindall and two others, tired of the fact that the market primarily catered to "big and tall" guys and the tall, well-proportioned man was all but forgotten. Longshot focuses solely on making perfect-fitting woven shirts for tall and fit men who stand from 6' to 6'8". Longshot shirts are ready-to-wear casual shirts that can be dressed up or dressed down - ideal equally for an important business meeting sans tie or for a night out. They have taken the decision to aim squarely for high quality, using only Egyptian 100s two-ply cotton woven in Italy. The final shirt is made by hand in the USA - a conscious decision to work with "the exceptional companies, workforce and ingenuity we have right here in the United States". As of April 2011, the collection includes six styles with a classic Oxford in several colors and some striped styles in ginham and twill. Shipping in the US is free (ground shipping via UPS) and internationally is at standard UPS rates. Returns are also free. M Jeans is a new jeans brand that caters to tall men who fall outside the standard sizes supported by commodity brands. This new brand focuses on men above 6'2" with waist sizes 30 to 48 inches. M Jeans combines design and fashion along with the fit and quality of custom tailoring. The niche that M Jeans fills is to provide expertly fitted jeans to those people that are not currently catered to because they are simply too tall. The Singapore-based brand was inspired by the word of mouth success of the hand-sewn jeans of M Jeans founder, Dutch-American product designer Mr. Mark Seeger. Currently the sole style is a classic straight cut, fabricated from raw select denim, featuring micro-suede pockets, micro-suede inner lining, and a unique 5-pocket design that exudes modest confidence and subtlety. The unique cuts are flattering and understated, suitable for the relaxed business-casual workplace. Sizes are selected by waist size and height - the inseam is selected for you based on the theory that "most tall men have no idea what inseam they should ask for". Instead, M Jeans uses measurements collected over the years that show very clear correlations between a man’s body height and the appropriate inseam. For someone 6’6″ tall, the inseam will be 39″. Mark has a point here - I have been wearing 36 inch inseam jeans for years but I recently tried on some 38 inch jeans from a local tall men's shop (since sadly closed down) and found that I really liked the longer inseam. Still, I do like to know what I'm buying! M Jeans are available only online and the cost of $150 is less than you would pay for some high-end fashion jeans. If you have a line of clothing that caters for tall men, let me know and I'd be happy to feature details here on Clothing Tall Men.